Cancer, the Crab, sprawls across the picture to the left of center. The most prominent part of the constellation is the distorted box near center that enlcoses the Beehive -- the Praesepe, with which the two flanking stars to the left, the "aselli," make the "manger," the one to the upper left Asellus Borealis, the one to the lower right Asellus Australis. 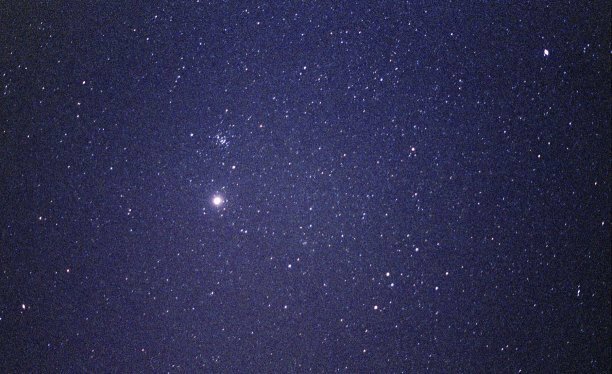 Immediately below the Beehive is bright Jupiter, which was moving through the constellation when the picture was taken. Al Tarf is at right center, above the ring of stars made by the head of Hydra, the Water Serpent, which is at lower right. Acubens (Alpha Cnc) is between Hydra's head and the Beehive, while Kappa is just below Acubens. 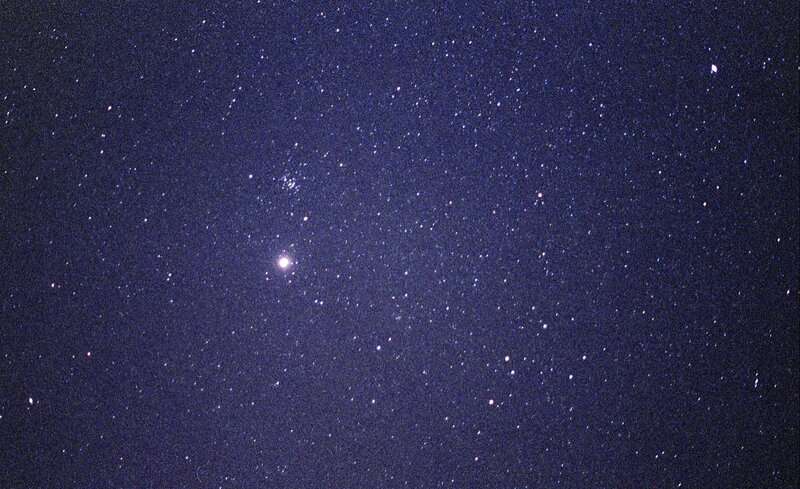 The mulitple star Zeta Cnc is the brighter of the pair to the right of the Beehive. At lower left is Algenubi (Epsilon Leonis), which lies at the west end of the Sickle of Leo, while to the upper right is Pollux in Gemini. See Cancer from Bayer's Uranometria of 1603. Cancer has a star with an orbiting PLANET. For more on Cancer, see Hot Crab Sandwich at Stellar Stories.